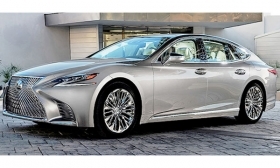 DETROIT -- The new-generation Lexus LS makes a design breakthrough for the brand with curvaceous lines and an aggressive front end. But the car's chief engineer says the flagship also sports what Lexus is touting as three world-first safety technologies. On tap are a new pre-crash auto-steering system and an advanced head-up display with two new functions, says Toshio Asahi, chief engineer for the LS. The new steering system doesn't just brake the car before a crash, as the current system does. It also automatically steers the LS around the obstacle, Asahi told Automotive News during the Detroit auto show in January, where the redesign was unveiled. The emergency auto-steering function guides the Lexus around cars in an impending collision and around pedestrians. Lexus' current auto-braking system can stop the car before impact only at speeds up to 37 mph. Auto-steering adds an additional measure of crash avoidance, especially in cases when a person might unexpectedly dash into the street, Asahi said. Asahi said he worked on the new LS for six years, essentially remaking the car from scratch on a new modular platform that will underpin rear-wheel-drive Lexus cars. Performance, delivered through a 3.5-liter V-6 twin-turbo generating 415 hp, and more emotional design were top considerations. But so was safety. "In our advanced safety packaging system, we have three features that are world firsts," Asahi said. After design and powertrain improvements, Asahi called imaginative safety technology the area of biggest evolution over the outgoing, fourth-generation LS. Lexus built upon the existing Lexus Safety System + pre-crash braking system. The second advance comes in the updated head-up display. Lexus says the color display, which presents projected data on the windshield, is also the world's largest. The new version also warns of pedestrians ahead. The pedestrian sensor system combines a stereo camera with millimeter-wave radar to improve performance at night when darkness limits camera vision. The third new feature is an intersection blind-spot detection technology that alerts the driver to vehicles coming from either side in hard-to-navigate crossroads. It uses millimeter-wave radar positioned at the front of the LS to look around corners for dangerous oncoming traffic. The safety system then alerts the driver through the head-up display. Lexus General Manager Jeff Bracken said the LS will make a "strong safety statement" by bundling the new safety technologies with Lexus Safety System + and making them standard.